The Bolivar Corona Junior Minuto is a modest-mid-price, short-smoke, somewhat heady Cuban, offering unique Bolivar flavours including a kind of ‘barbecue’ & roasted chestnut, tho at times with some dull spots, so perhaps not the equal of the similar size & price Cuban Ramón Allones Small Club Corona. 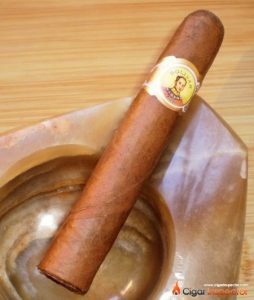 This short Bolivar is one of three in the same Minutos vitola in what Habanos describes as its ‘full flavour strength’ category, along with the Ramón Allones Small Club & the Partagás Shorts. The Bolivar is, however, noticeably milder than the take-no-prisoners Partagás, and perhaps slightly less strong than the Ramón Allones. Amongst Cubans I have a soft spot for Bolivar, given they uniquely make cigars in two of my favourite sizes, the short corona as here, plus a nowadays-rare hand-rolled medium-long panetela, the Bolivar No 3 (125mm x 34). Bolivars have a distinctive flavour palette, and amidst the Bolivar expierience is not only a very pleasing roasted chestnut sort of flavour and aroma, but a very striking ‘barbecue’ kind of meaty flavour that is particularly Bolivar. Those unique flavours are why I can’t resist picking up these small-format Bolivars every now & then. The Bolivar Corona Junior seems to have particularly good construction in the exemplars I’ve tried over time, without the tight draw so common in small-format Cubans, never needing my cigar-piercing tool. Burn is usually quite nice. The one pictured here had a brief ‘canoe’ hollow during the burn but nothing serious. The wrapper is often nicely oily, if not always super-pretty. Smoking experience is sometimes a bit uneven, with flat patches mixed with flavour bursts. At moments a Bolivar can have a beautiful aroma that is just not reflected in the taste. The one here in the photo started out pleasingly nutty, then grew quite flat to the degree I began to think ‘What am I smoking here?’ The middle third, however, opened with majestic flavour explosions, some of the roasted chestnut along with woody and earthy notes, and the famous ‘Bolivar barbecue’ was not missing, I almost opened a bag of paprika crisps. The final third got a bit flat again, where you have the sense of smoking a slightly heady cigar but just not enough flavour to match the strength. This led me to recall my opinion that the also-heady Ramón Allones Small Club is the preferred cigar in this vitola, with its chocolate-like evocations and more consistent flavour interest. For a slow puffer like myself, the methodically-burning Bolivar Junior short corona is about a 35 minute smoke, maybe around 25 minutes for the average stogie person, or a bit less than 20 minutes for heavier puffers. One might say a word here about the names of these cigars and vitolas in Spanish & English, which can be confusing due to the singular / plural forms. Is this vitola ‘Minutos’ or ‘Minuto’? On the Habanos website, they tend to list both cigar names and the vitola category in plural form – ‘Coronas’, ‘Robustos’ – whereas in English we would tend to use the singular. The Bolivar cigar in this review is listed by Habanos as the ‘Coronas Junior’, and the vitola as well is listed as ‘Minutos’, though if your shop has the machine-made Guantánamera Minutos tubos from Cuba, you might see the tube with ‘Minuto’ in the singular printed on it. In English we tend to copy the Cuban plural form when citing the cigars, except in cases like ‘corona’ or ‘robusto’ where we already generally use the singular. A less-common Cuban cigar word such as ‘Minutos’ might more often appear in plural. In short, both forms are ok, hence the apparent confusion.